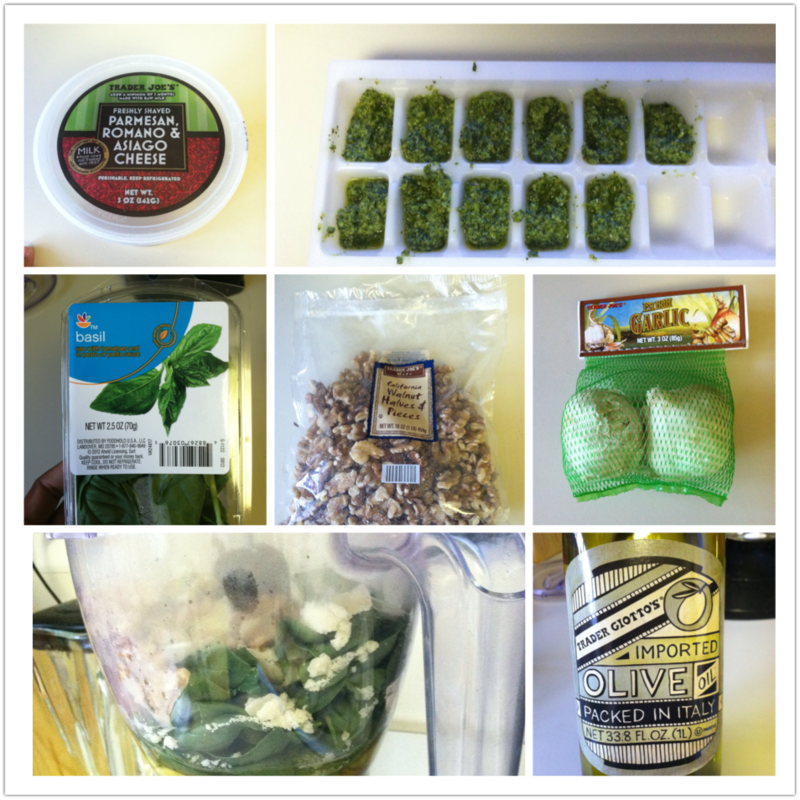 It’s time for another installment in the Thrifty Cooking Series and today’s topic is pesto. Yes that deliciously flavored green slurry that makes certain Italian dishes taste so yummy — pesto. For a long time, when the Thrifty Chicks thought “pesto” we immediately thought “pasta”. But we are here to help you change how you think about this flavor-filled rock star and how it can bring more than your pasta dishes to life. Around the same time we started cooking nearly every meal we’ve eaten since we started Operation Do Better, we began making our own pesto. Don’t get us wrong, the jarred stuff is delicious and convenient. But for the size, usually less than 7 ounces, and our money, pesto is pricey. When we read the ingredients on a jar, we were surprised at how simple the ingredients were. Aside from the preservative ingredients that give jarred pesto its shelf-life, pesto is nothing more than parmesan cheese, extra virgin olive oil, basil, or some other kind of green herb, garlic and some kind of nut, usually pine nuts. Blend them in a food processor and Presto! Pesto! There also are tons of other ingredients you can use to make pesto and plenty of recipes on the Internet to help you do it. For our recipe we substituted pine nuts with walnuts because they were cheaper. We bought a rather large bag of walnuts from Trader Joe’s and it’s lasted us about six months. We keep the walnuts in the refrigerator so that the oil in the nuts doesn’t get rancid. We usually buy the biggest container of basil we can find and make a rather big batch. We preserve our pesto, without preservatives, by freezing it in an ice tray with a layer of olive oil on top. The stuff keeps in the freezer, without getting freezer burned, for a pretty long time. We never leave it in the freezer longer than a month because we use the stuff in so many of our dishes. Pasta: Of course we use pesto very traditionally in pasta dishes, but the way we use it is probably a little different. We occasionally use it as a stand alone sauce, but often times we use it to add flavor to store bought white and red pasta sauce. We’ll soon be making our own pasta sauces, but we’ll likely still add pesto because we really love the flavor. Fish/Shrimp: We discovered this summer that pesto is great on fish and shrimp. Slather it on skewered pieces of shrimp and salmon, grill or bake. Not only is it delicious, but it keeps seafood from drying out in that cooking process. What you’ll have is succulent morsels of seafood that will disappear from plates. Mayo replacement: During a recent tubbing adventure, our girl Sunny S. whipped out these mini-sandwiches with pesto, mozzarella cheese and tomatoes. All served on mini-whole wheat bagels. And she blew our entire minds! They were that good. The pesto was the delicious glue that held these bad boys together. And when you think about it, pesto would make a pretty awesome replacement in many of the salads and sandwiches that call for mayo. A new twist on potato and macaroni salad, you say? Why certainly! 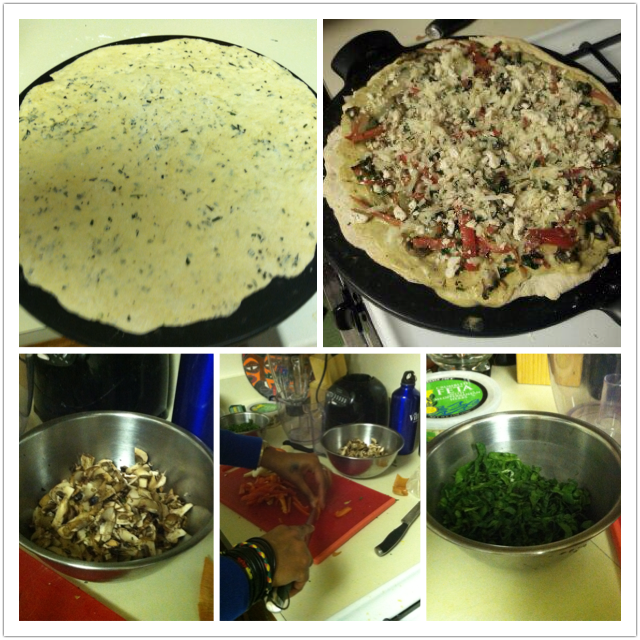 Pizza: We like making homemade pizza more than we like ordering it out. The act of flavoring our dough and deciding what kinds of toppings we want to add to our pizza really is an ever-evolving thing at our house. We have put pesto in our dough and we certainly have made it the primary sauce on top of our pizza and mixed it in store-bought sauce. It is delicious. Period. If you’re bored with what’s on your plate and what it taste like, give pesto a chance. We don’t believe you’ll be disappointed. Categories: Cooking, DIY, Uncategorized | Tags: cheese, cooking, DIY, foodie, homemade, mozzarella cheese, parmesan cheese, pasta, pesto, pizza, seafood | Permalink.